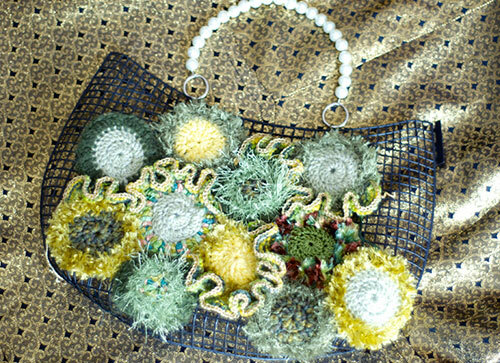 Make a unique freeform knitted and/or crocheted handbag from patches of random shapes you will make out of colour-themed textured and sparkly yarn. Easy – no pattern required. Just imagination! Freeform yarn knits will be available in the class for $20 cash (normally $40) which includes a mini stash of 13 glittery, fluffy, fancy art yarns in colour coordinated themes, a mesh frame, and the pattern instruction.